250gr (8.82oz) Price is per pkg. Full case is 8-pkgs. mais starch, potato starch, mais flour (13%), rice flour, extra virgin olive oil (5,9 %), palm oil, glucose syrup, salt, psyllium seed husks, raising agents: ammonium carbonate, sodium bicarbonate, diphosphate, emulsifier: soya lecithin, flavours. 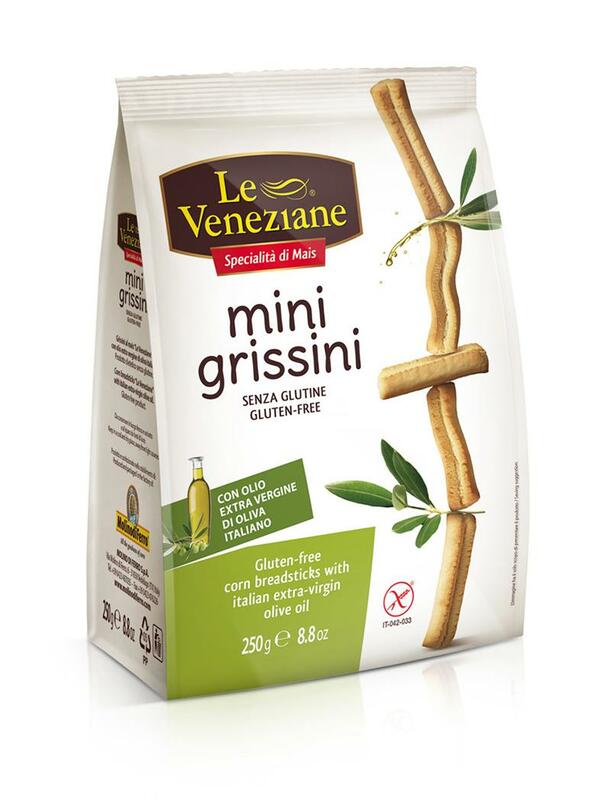 The fragrant, flavoursome and crispy “Le Veneziane Mini Grissini” are perfect at any time of day: they are irresistible with cold meats and exquisite with sauces and fresh cheese. They are made with select Italian extra virgin olive oil and the outstanding quality of the ingredients used means that they are a superb alternative to bread. “Le Veneziane Mini Grissini” are created by expert bakers. They are flavoursome, appetizing and make a delightful change. Try them: they’re gluten free!